Revolution XT Ring Saw from Gemini Saw Co. This Saw is Absolutely Amazing...Check it out! No Water Pump, completely Self-Contained. 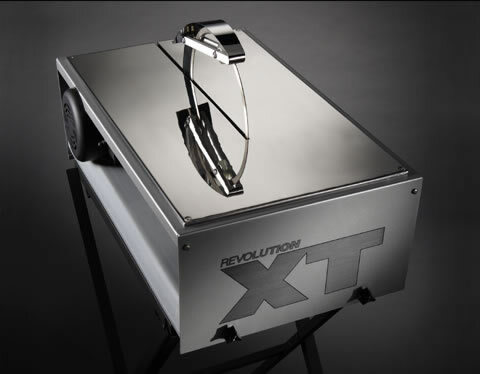 The Revolution XT uses a 10" Sintered Diamond Blade: this type of a blade is made up of pressed powder and diamond. Since the diamond is throughout the blade, more diamond is exposed as the blade wears. This results in a blade that is always sharpened and has a longer blade life. The Revolution blades are very similar to the solid 10" diameter blades you will find on most high quality wet saws. The difference is that our blades have no center, giving you the ability to not only cut straight lines but also make tight radius cuts. Because we run our blades at a much slower R.P.M. than any tile saw but with far more torque, they give the user a much higher quality cut with far less chipping and superior blade life. 10" diameter Sintered diamond, Forward cutting 3/4" radius. A) The ability to make STRAIGHT or CURVE cuts. B) Easily cut a slice off the edge of your material. The blade remains stable and rigid without wandering. C) The ability to have diamond coating on the front and back, (with double sided blade) making FORWARD as well as BACKWARD cutting possible. D) Use the same blade for all materials. There is no need to change blades. E) Material will never glaze over, so there is no need to ever dress the blade.